Some time last year, previously classified footage of a lunar mission was anonymously uploaded to a web site, www.lunartruth.com. This footage was allegedly recovered from a secret US mission to the Moon in December 1974, Apollo 18. But the astronauts never made it back to Earth, and so everything about the mission was buried even deeper. Until now. Or, at least, so we are supposed to believe. 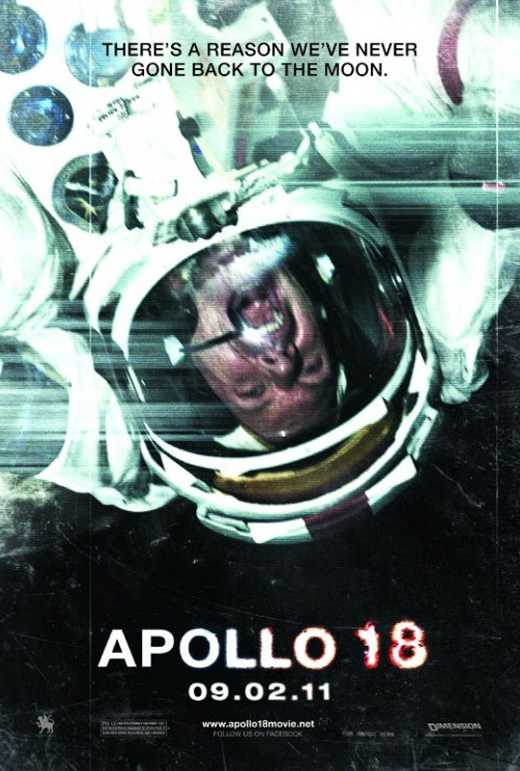 The web site was actually viral marketing for the movie Apollo 18, which appeared in cinemas this summer. According to text at the beginning of the film, the movie is edited from the footage uploaded to the web site. In other words, everything that appears on the screen was shot by the cameras the astronauts took with them. It’s all fictional, of course. Every one of the Saturn Vs built are accounted for – and when something costs that much money and requires that much expertise – the rockets are still claimed to be the most complex engineering projects ever undertaken – they don’t go “missing”. According to the story of the film, Apollo 18 was a secret Department of Defense mission, sent to place some early warning ICBM detectors on the lunar surface. Except it’s hard to understand how effective such devices would be on the Moon. But that doesn’t matter, because there is another secret purpose to the equipment. I went to watch Apollo 18 at the cinema because I wanted to see how accurately the movie depicted an Apollo mission. I was not especially interested in the plot – and certainly not in a story of Moon creatures attacking astronauts. The presence of a LK lander was, however, an unexpected bonus. And… in terms of accuracy, Apollo 18 makes a pretty good fist of it. The hardware all appears to be correct – even the Soviet lander. The film-makers clearly had trouble emulating micro-gravity and the Moon’s one-sixth gravity, and in some places it doesn’t appear especially convincing. But they intercut footage from the real Apollo missions, which helps improve the verisimilitude – even if the cutting between black-and-white and colour footage does begin to annoy after a while. Having said that, every foot of film in Apollo 18 is supposed to have been shot by cameras in situ. In one or two places, the film-makers slip up and frame shots that could not have come from them. And, it has to be asked, if the mission never returned to Earth, how was the footage recovered? Some of it is from television cameras, but other footage looks to have been shot on 16mm. There was some vagueness in the tasks performed by the three astronauts during their trip to the Moon and the LM’s descent. I was waiting for LMP Anderson to begin reading out height and fuel, but he did this only briefly. And then the LM landed. But mostly the dialogue was convincing. Except… It’s unlikely an astronaut in 1974 would have known details of the abandoned Soviet lunar programme. That one had existed, perhaps; but not that the lunar lander was called the LK. Apollo 18‘s story felt somewhat lopsided. Very little happens for the first two-thirds, as the mission approaches the Moon and then the LM makes its landing. But then the the story begins to pick up when Walker and Anderson discover the LK and the dead cosmonaut. It’s a shame it then devolve into a silly monster movie.To be fair, the moon-rock creatures are quite effective, and a real sense of paranoia develops in the LM between the two astronauts after the first attack. I will probably buy the DVD for the collection, but the film is not really worth paying the inflated price of a cinema ticket to see. This entry was posted on September 15, 2011 at 9:00 am and is filed under Apollo, fiction. You can follow any responses to this entry through the RSS 2.0 feed. You can leave a response, or trackback from your own site. Dang. Elements of this sound remarkably similar to a novel I was working on for NaNoWriMo back in November ’08: a secret post-Apollo mission because A-17 reconnaissance photos (from the CM) showed a fresh landing site, and the N-1 explosion could have been faked. I even subbed a shorter version of the story around a few places. The Apollo crew finds a Luna Korable which suffered a mishap on landing, and the pilot was killed. No silly monsters, and the crew gets back okay.